Hope our friends in U.S enjoyed the long weekend. I did. We visited friends and even hit the malls to check the Memorial Day sale. By the crowd in the malls, I could see most people were making good use of the discount sales. I did not find anything I wanted so came back empty handed but had fun nevertheless being out and about. 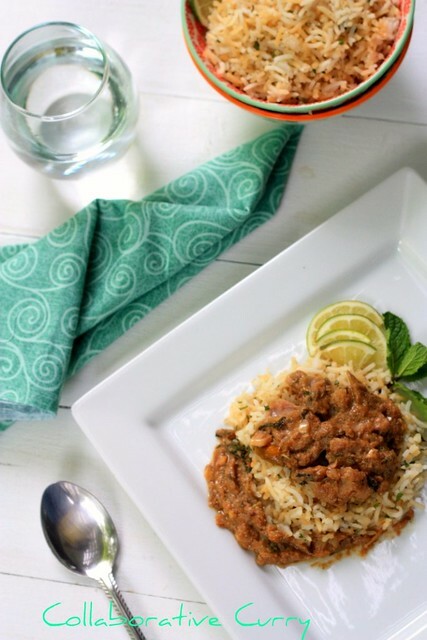 I made some cilantro rice on Friday and had it with chicken curry. I always enjoy the Chipotle burrito, especially the rice they pack in it. To have a change from the usual white rice, I decided to try my hand at cilantro rice and what do you know, it was pretty good! 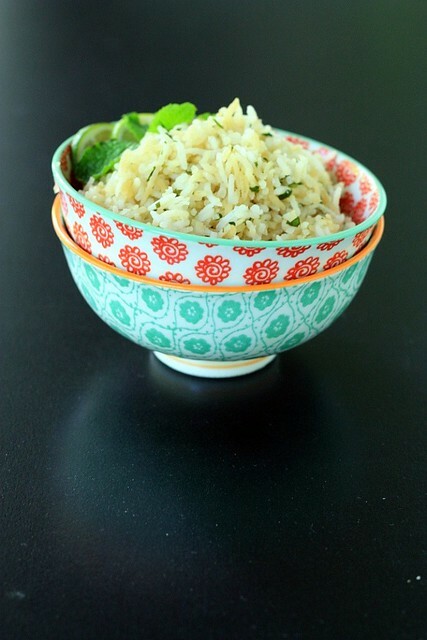 When you have guests over and have too many things to cook, this rice will make be easy enough to put together, and yet keep the festivity alive because this rice has the zing of lemon and a burst of cilantro flavor. I have seen recipes which calls for lemon zest and I say go ahead and do that if you like. I have not used it in the recipe below but I can see it will be fun to add some lemon zest to add more punch. You can play with the amount of lemon juice to make it suite your palette. Lemon and cilantro cannot go wrong in the coming summer months. Don't you agree? The possibility of mixing this rice in your salads and wraps is endless. It's also great with chicken or any other curry. 2. Bring about 10 cups of water to a boil. Strain the water from the soaked rice and slip it into the boiling water along with bay leaves, and enough salt. Taste the water to make sure there is enough salt. Cook the rice al dente. 3.Chop the cilantro fine and mix it with lemon juice, soya sauce, and oil in a serving bowl which will hold all the cooked rice. Add a couple of spoons of rice and mix with the cilantro-lemon mix. 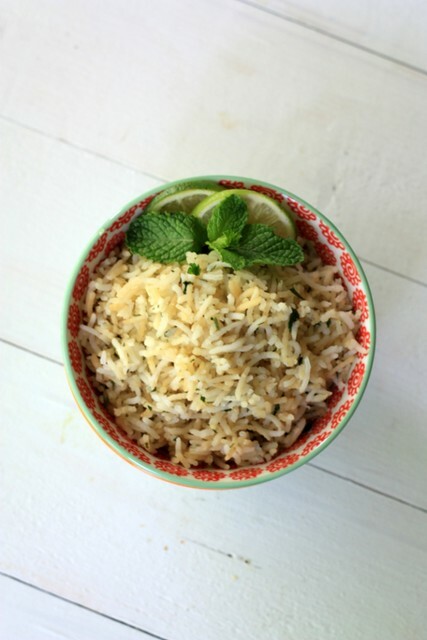 Add the remaining rice on top and using a fork fluff the rice until well mixed with cilantro and lemon. 1. If the cooked rice is not salted well enough, add more along with the lemon juice - preferably, dissolved in the lemon juice to have it evenly mix in the rice. 2. If you like the rice to be white in color avoid the soya sauce and replace it with lemon juice. I like this recipe and will try . I take note of using a bit of soya sauce too. Lemon rice looks extremely delicious.. I'm a huge fan of citrusy flavors and I can just imagine how good the rice must have tasted with the lemon and cilantro seasoning. Beautiful bowl of rice..looks tangy and appetizing!! Oh super combo...and this rice looks super too!! I think I can just eat this rice on its own. I love flavored rice as they are so tasty. Next time I must cook this when I cook the Indian curry, simply yummy! Lovely combination, rice looks delicious. Sunitha...the rice looks delicious and flavorful! And how one can stop themselves from buying something they don't really want but looks great...is something I'll never understand! ;) Renee! Lemon rice looks delicious.The flavour of bayleaf and soya sauce makes it special. As Shyama is in College and cook food for her on sunday so she can take with her when she goes to her place and i am looking for making new variety of rice too. This loooks so so good. It is really hard to find good stuffs during such sale.. I have returned empty hand umpteen times. Cilantro lemon rice is always my fav.. Tempting and flavorful meal..absolutely delicious. Lemon rice is my fav for sure, i enjoy it most during travel and picnic and this combo is even more amazing!! and like pic with stack of two bowl! That sounds delicious. And it would go nicely with a burrito or Indian curries - very flexible recipe too. Delicious!